A friendship begun through a mom’s group: so many women remember and cherish these connections for the rest of their lives. This is especially true if the moms are first-timers bewildered by the abrupt change in life, the sleep deprivation, and the crying that can only sometimes be assuaged by breast, bottle, diaper. Our small group of new moms, in a city known for its annual garlic festival, forged a strong alliance as we walked the world behind strollers, helping each other through the ornate tangle of Moby ribbons, picking up each other’s baby if hands were full. 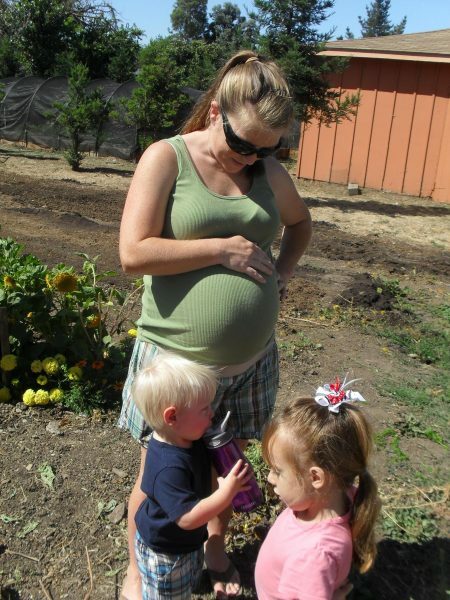 Our group would’ve been forever friends anyway, but something extraordinary has further cemented the 2007 Las Madres of Gilroy moms: one of us lost her child. “Lost” isn’t the right word; I’ve always struggled with its mild banality. Jennifer L. Kranz wasn’t in some abandoned wood waiting to be found; she died in her mother’s arms after less than four months of desperately-increasing illness. Her form of pediatric cancer is called Diffuse Intrinsic Pontine Glioma, DIPG for short. DIPG is always terminal upon diagnosis—and as soon as her mom Libby got the news, she started blogging. Those who knew Jennifer—and those who didn’t, strangers who found the blog—read breathlessly and in terrible pain each day as Jennifer declined. “Declined”: again, a softened word that doesn’t convey the agony of a woman documenting her daughter’s death at a speed which terrified every single one of us. 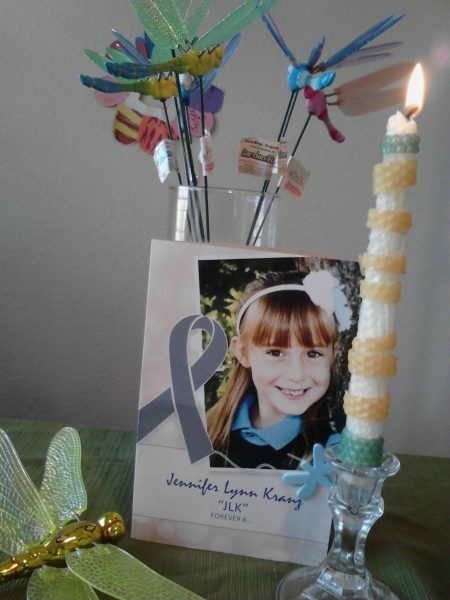 Jennifer, a sweet six-year-old with an impish grin and a maternal urge toward her younger brothers, died February 12, 2014. Her parents, Libby and Tony, did not close their doors and withdraw into grief. They opened their doors and invited us all to work with them to find a cure. That’s what Unravel Pediatric Cancer, the 501(c)(3) founded by the Kranzes, does. It funnels money directly to researchers that Libby meets with personally. Among the many fundraising efforts Unravel spearheads (road races, golf tournaments, lemonade stands) is a heroic undertaking that has involved people in 49 states and several foreign countries. It’s called Fluttering, and it is taken place every September since Jennifer died. Each night for that month, Flutterers move a fleet of 12 dragonfly lawn ornaments from yard to yard with literature explaining Jennifer’s story and the mission of Unravel. For a small donation, the Fluttered person can select where the dragonflies land next. It’s a push for awareness just as much as an initiative to raise funds for research. After all, Libby herself has admitted she used to change the channel when the St. Jude’s commercials came on. But a lawn full of bright, joy-filled childish dragonflies is hard to ignore. Dragonflies were special to Jennifer, and Unravel’s dragonfly logo incorporates her drawing of two hearts that form the creature’s wings. Each Fluttering kit contains 12 dragonflies, commemorating her death on the 12th. There are also 12 types of pediatric cancer, adding to the number’s importance. The “Give Us 12” mission invites people to donate their time: 12 seconds to do something as simple as liking Unravel on Facebook, or 12 minutes or even 12 hours. The link above gives concrete examples of how to help. Another of Libby’s projects is the #ForThemBecauseOfHer movement. She does something special for her living children—and says yes sometimes when she’d be inclined to say no—as a favor to Jennifer. Even if it’s something minor like pausing to let the kids jump in a rain puddle when the family is in a hurry, there has to be some positivity and pleasure in the midst of her family’s mourning. Accordingly, every 12th my family goes out for frozen yogurt, a treat Jennifer used to enjoy as a Celiac sufferer. It’s for them—my kids, who I crave to keep from the evil jaws of cancer— because of her—an absolutely unforgettable, light-filled child. I’ll end with another of Libby’s mottos: Don’t just be sorry; be active. 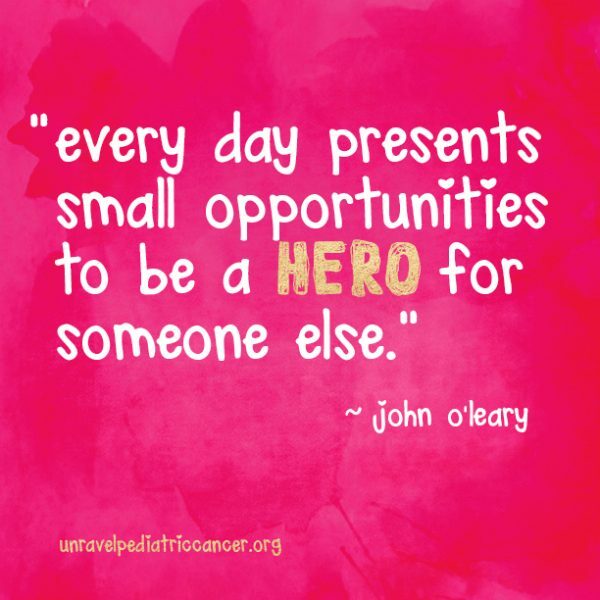 Visit www.unravelpediatriccancer.org for more information. Flutter kits are still available for October Fluttering, and there are many other ways to be involved: check the website.